Being over 17m long, and having a water depth of almost 3m, this is one of the largest domestic pools we have constructed. The pool, which incorporates a hidden motorised cover system, is built to our standard specification, however the walls and floor have a limestone finish. We also constructed the bespoke spa, which has the same limestone finish as the pool, along with the sauna and steam room. This 10m by 5m tiled pool incorporates a motorised slatted reel cover system, which is housed in a pit below the pool surround. Unfortunately, the pool cover stops you seeing the octopus feature in the base of the pool, which our client imported directly from America. This project shows how the best use of the available space can be made by having the pool hall open to the roof, and introducing roof glazing, along with the large windows. 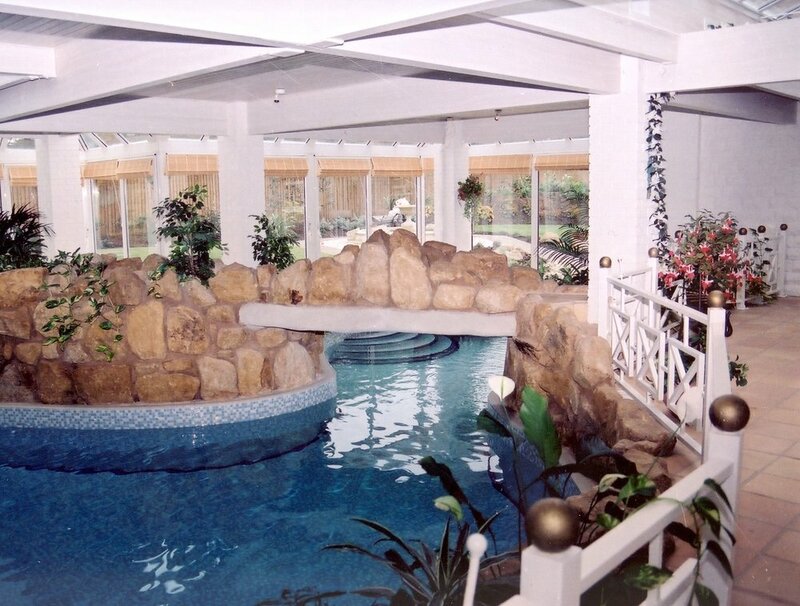 This project in Ribblesdale involved the construction of a 10m by 4m pool with a glass mosaic finish. We also constructed the bespoke spa, adjacent to the pool. As you will see, we picked a good day to photograph this pool hall, with the sunlight streaming in through the glazed walls of the sitting area. The 10.0m by 4.5m pool is finished with glass mosaics, and incorporates a hidden motorised cover system. We built this 12.5m by 4.0m pool to a deck-level design, where the water runs over the top of the pool wall, and down through a slot in the floor surround. Although we constructed the spa as a separate unit, we created a weir between the two, to allow a waterfall effect to be produced. Both the pool and the spa have a limestone mosaic finish. 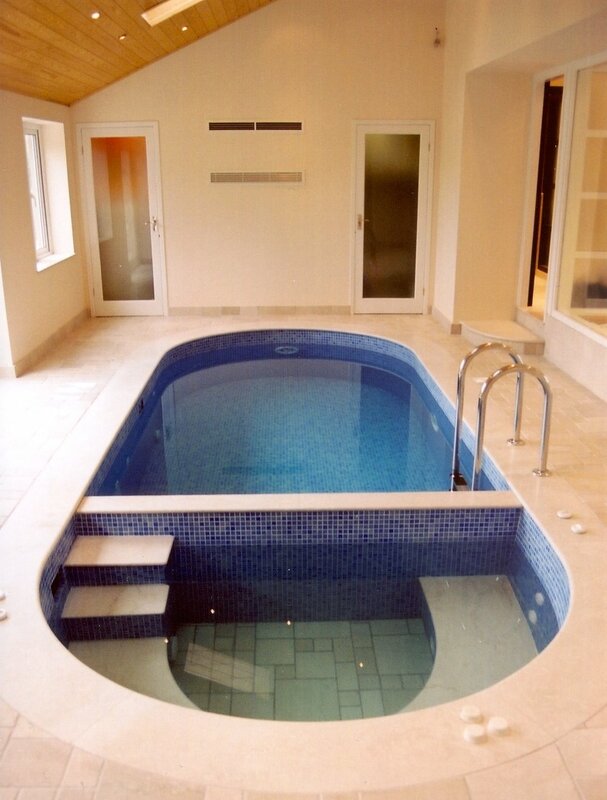 We installed this 10m by 4m pool as part of an extension at our client’s home. 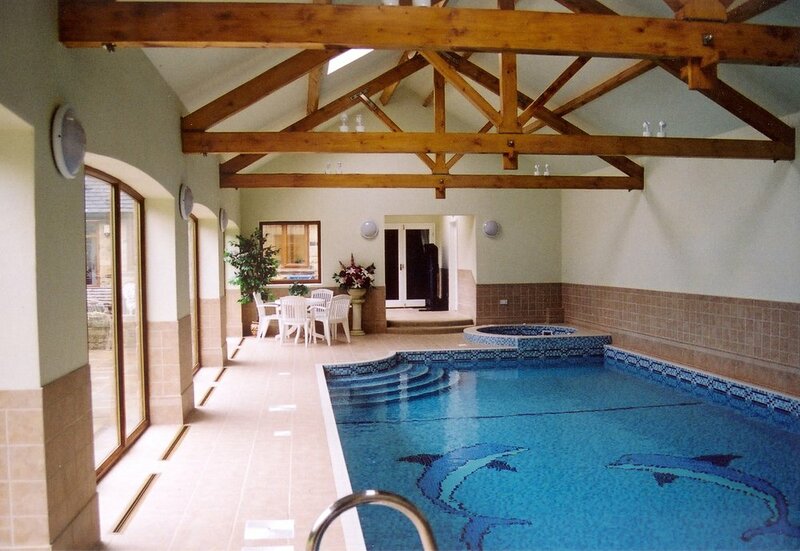 We constructed this indoor pool for a client in Lancashire. The pool is 14.5m long by 5.0m wide, with water depths of 1200mm to 1800mm. The pool is finished with an iridescent glass mosaic, which produces exciting effects within the water as the light in the room changes. The pool features a hidden motorised pool cover. In addition to the pool, we installed the fully tiled spa, together with a sauna and steam room. Our client was having an extension built with a floor area of less than 45 square metres. Never wishing to be seen to shirk from a challenge, we were pleased to help our client design his extension to accommodate a pool, spa, and sitting area. The pool is 5.3m long by 2.5m wide with a constant water depth of 1.4m. The pool incorporates a counterflow swim unit that produces a strong flow of water against which the bather can swim. The spa is a 2m octagonal built in unit with a mosaic-tiled surround to match the pool. This pool is a great example of an indoor family leisure area. The fully tiled pool is 10m long by 4.7m wide, and features curved steps into the pool at the shallow end. In addition to the pool we constructed a spa that has been finished in mosaics to match the pool. A double dolphin motif has been formed within the pool mosaics on the base of the pool, and a rope design has been formed in the pool tiling at the water level. The pool incorporates a motorised pool cover system housed in a pit formed at the deep end of the pool. The pool has been built close to the building along one side with the pool wall supporting the building. Our client’s own builders constructed the reinforced concrete shell for this pool after which we took over and completed the project. The pool is 11m long by 5m wide, with a constant water depth throughout of 1.3m. Large walk down steps provide safe access and egress, as well as a sitting area within the pool. This pool hall formed a link between our client's house and garage block with the width being restricted due to planning constraints. The pool is 12m long by 3.8m wide, with a constant water depth throughout of 1.35m. At one end of the pool we constructed a pit beneath the raised seating area to accommodate a motorised pool cover system. The pool plant and air handling system are housed in a room below water level at one end of the pool. The distribution ductwork rises up into the ceiling void to distribute conditioned air back into the pool hall. We constructed this 12.5m by 4.5m deck level pool as part of a major refurbishment at our client's home. The pool forms part of a leisure and fitness suite built into a banking with the garden coming down onto the roof. The leisure area contains a spa and steamroom for which we provided the equipment. As the pool is uncovered, we installed a combined dehumidification and fresh air system to maintain the pool environment. We constructed this freeform pool at the home of an architect. The pool hall formed a link between the house and outbuildings that had been converted into their studio. The pool is over 15m long and is divided into two areas by a bridge across. The area shown on the photograph is the shallow end of the pool that incorporates walk-down steps, a seating area in the pool, and a waterfall. A decked seating area has been formed that cantilevers over the pool. The original thought was to install a prefabricated swimspa. However, difficult site access made for a rethink. The result is an exercise pool and separate spa, together with a sauna, sitting area and plantroom all within what seemed an impossibly small space. 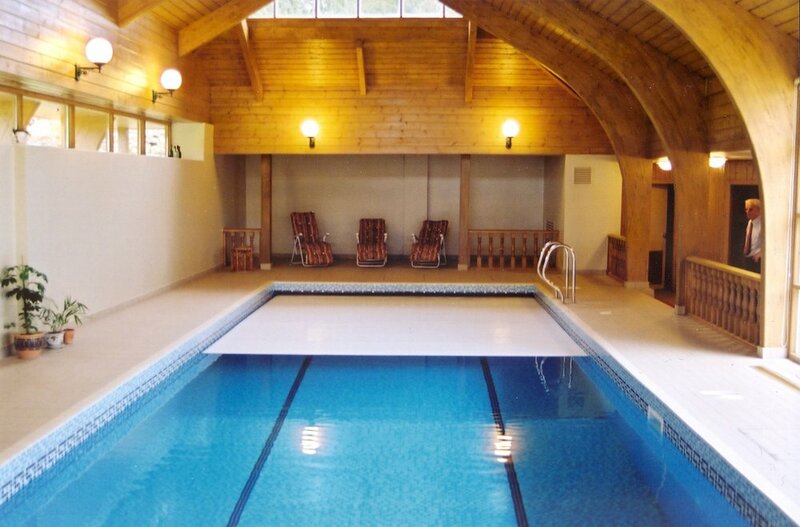 The pool is 4.25m long and has a counterflow swim unit fitted in the end wall. The spa sits four to six people and has a stone finish to the seats and base. On this project we worked alongside a design company who specialise in pool hall interiors. The walls are finished with hand painted tiles, and the ceiling is a hand painted mural. The pool is fully tiled and features a mermaid motif to the base. A motorised pool cover was installed which is housed in a pit beneath the pool surround at the far end of the pool. The spa has a marbled finish and is set within its feature surround which projects into the pool. A local architect who we have worked with on several projects designed this pool. The pool has a freeform shape that creates two distinct areas either side of the bridge that forms access to a mosaic tiled spa for which we won a SPATA award. The architects brief was to design a scaled down version of a competition pool that would fit in the available space. The pool is 12.5m long with lane markings set in the floor tiling. This photograph shows the slatted reel motorised pool cover in action. The cover is housed in a pit formed at one end of the pool and operates at the touch of a button. Our method of construction allows the front and top of the pit to be fully tiled with only the narrow “letter box” opening across the front at water level. We strayed outside of our natural environment to build this pool in Gloucestershire. Built at the side of a Manor House the pool hall is dug into the banking of the garden, this allowed a sheltered outdoor sitting area to be formed through the french doors. The freeform pool is over 15m long and incorporates walk down steps, a seating area within the pool, and an island that provides support for one on the pool hall columns. This 15m long pool had to be constructed to fit the size of the existing barn, which limited the width of the pool to 3.6m. Whilst we consider all our pools to be bespoke, this project was more so than most. The charcoal black surround, the dark green Italian mosaics, the bespoke pool ladders and the stainless steel grilles for the air-handling system, were all specified by our designer clients. The shape of this pool includes nine straight sides with nine curved corners. The pool shell had to be carefully set out to ensure that the two staircases were in the exact positions. As well as the main pool, we installed a spa in the far corner, behind one of the staircases. As an example of what can be fitted in to a small space, this 4.5m by 3.0m pool takes some beating. The pool incorporates a counterflow swim system, built in to the pool wall, which allows the bathers to swim as far as they want, without ever reaching the end of the pool. As you will see from the photograph, the outstanding feature of this pool hall is the large glazed roof section. Supported on steel sections, and incorporating air-handling ductwork to keep the surface free from condensation, the glazing allows the daylight to shine through. This 11m by 4.3m pool was installed many years ago, and was in need of bringing up to date. We undertook a complete refurbishment, which included installing new fittings and filtration, and retiling the pool with glass mosaics.